Waiting in line doesn’t seem so long when there’s a diversion. Singing and dancing, carols and comedians. 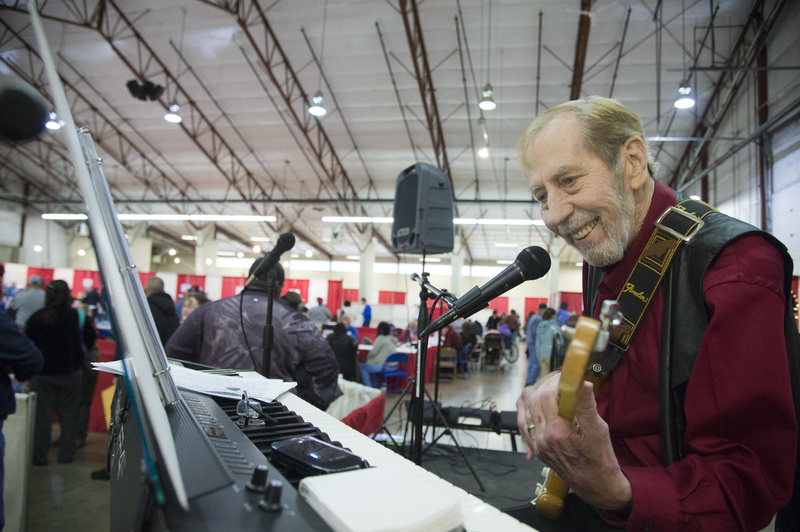 For the recipients working their way to the front of the line at the Christmas Bureau, a variety of entertainment acts helped pass the time while creating a merry atmosphere. Organized by Catholic Charities, Volunteers of America and The Spokesman-Review, the Christmas Bureau distributed toys, books and food vouchers so 30,208 needy people could have a merrier Christmas. The charity is a Spokane tradition funded entirely by donations since 1945. Though the bureau closed last week, donations will be accepted through noon Monday, Dec. 29. It still needs to raise more than $180,000, with 96 percent of those funds going directly to the books, toys and vouchers, since it’s staffed by about 400 volunteers. The entertainment groups volunteered as well, hoping to create a festive feel for the recipients. King is also a guitarist with entertainment troupe Hillyard Belles, which performed toe-tapping, vaudeville-style singing and dancing routines at the bureau. Numerous student groups also performed, from East Valley High School’s Strolling Strings and Ferris High School’s Canterbury Belles to the Gonzaga Prep Jazz Choir and Sacajawea Middle School’s 30-member choir and seven-piece string choir. Other acts included the Blazing Divas, The Carol Jones Band, Donna Madej on the harp, Alaine Qualls on the accordion and singer Jace Fogleman, to name a few. During the bureau’s nine-day run, all but three hours were booked with volunteer entertainers, said co-chair Christy Folkins, who lines up the acts. She wants the entire Christmas Bureau experience to be welcoming and joyful, from the moment recipients step into line to the time they leave with gifts for their children, a small voucher to buy food, and wishes of goodwill on behalf of the donors who give generously to help those in need. A new hit this year was ventriloquist Michael Waldrip with his buddy Chester, who Folkins said has performed all over the world. “People loved him,” she said, describing how she watches the people in line and loves to see their eyes light up as they enjoy the music and entertainment. When singer and pianist Jimi Finn segued from the carol “Joy to the World” into a rousing rendition of Three Dog Night’s tune by the same name, for example, it was an unexpected and crowd-pleasing medley. Jeremiah was a bullfrog at the Christmas Bureau. While waiting, the adults often sing along to familiar tunes while children spin circles and dance to the jovial melodies. Tipke Manufacturing Co., of Spokane, gave $2,000. Justus Trading Co. Inc., of Hauser, gave $1,000 in memory of their fathers, Roland “Curley” Justus and Thomas Smith. “Thank you for your hard work each and every year!” wrote Duane and Cristene Justus. K. Wendell Reugh, of Spokane, gave $1,000, as did Paul and Kathy Lin. Charm Stanek, of Saint Maries, gave $750. An anonymous Spokane donor gave $500. BPS Supply Co., of Spokane, gave $500. “As in the past we are happy to donate to this worthwhile fund to help those who are in need in our community. We also thank all the agencies and volunteers who make this possible,” Mary Strange wrote. Colvico Inc., of Spokane, gave $500. An anonymous Spokane donor gave $400. “We appreciate all the good work you do as would the wonderful lady we are doing this in memory of this year, Sister Margaret Schweiss,” they wrote. Claude and Mable Mitson, of Spokane Valley, gave $400. The staff at Farwest Insurance Agencies on Garland gave $390. “Thank you for all you do,” they wrote. William and Nancy Henry, of Spokane, gave $300 in memory of their parents, Bo and Mary Henry and Robert and Marian Heglar. Alan, Heidi, Tim and Evan Shustoff, of Spokane, gave $250, as did Daniel and Theresa Lennon. Jane Joseph, of Spokane, gave $242.45 via PayPal. An anonymous Spokane donor gave $200. “Thanks for all the effort and care you provide to make wishes come true,” they wrote. Barry Bergau, of Spokane, gave $200 in Debbie and Terry Montgomery’s names, in lieu of exchanging Christmas gifts this year. Richard and Fern Roark, of Spokane, gave $200. Shelby and Knox Pittman, of Spokane, gave $150. “Thanks for all your hard work and dedication to the Spokane community!” they wrote. The Murray family, of Spokane, gave $150 in memory of their loving wife and mother, Eileen Murray. “God bless the bureau and all its volunteers who work to make Christmas a little happier for many who are less fortunate,” they wrote. Laverne Linder, of Spokane, gave $101. Dan and Carole Driscoll, of Colbert, gave $100. Alan and Darci Gayda, of Colville, gave $100. “Thanks for all the good work you do. We are glad to be giving again,” they wrote. Algeo and Clarke PS, of Spokane, gave $100. An anonymous Spokane donor gave $100 in memory of her mom. “I applaud every one of the volunteers and donors for all you do for the children. Thank you. I am happy to donate twice what I usually donate,” she wrote. Spokane donors giving $100 include Diane Veltri, J.A. and J.M. Hensley, Richard and Roberta League, and Steven and Elizabeth Hitch. George and Hilma Bloomsburg, of Worley, gave $100. Allison Douglas, of Paris, gave $96.80 via PayPal, in honor of her mom, Barb Douglas, who volunteers at the Christmas Bureau every year. Cynthia Trevey, of Spokane, gave $96.80 via PayPal. Cathleen and Jeff Walter, of Otis Orchards, gave $75. Dixie and Mary Riddle, of Mead, gave $50, as did Bill and Marian Adams, of Spokane. Harry Owhi, of Coulee Dam, gave $25. Ray and Betty Fall, of Spokane Valley, gave $25 in memory of their grandson Jason Emery, who died in 2005. Alfred Ungaro, of Spokane, gave $20, as did Carrie and Scott Rider, of Spokane Valley. Carolyn and Alan Fisher, of Cheney, gave $10.